"Thank you so much for providing information on someone to call that understands about the pain I'm in over loosing my best friend, my reason for getting up everday, my beloved Sasha." Article: Pet Grief Support: Who Can I Talk To? "The article was useful, offered practical tips, and was appropriately emotional (but not sappy). Its tone was one of respect for both the beloved pet and the special pet-guardian relationship." "I thought this article was helpful. I felt like I was reading my own story. Thanks." Article: Is it Okay to Grieve for Your Pet? "I have done just what the article says, I feel better knowing that I am not alone. Thanks for making one of the hardest moments of my life easier to bear." Article: Did You Feed Your Deceased Pet Today? 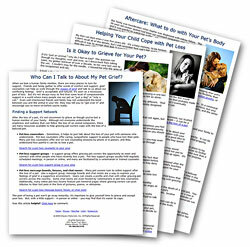 If you have just lost a pet or are about to lose one, these resources are a good starting point. You’ll find articles and information about pet grief, finding support, making final arrangements and memorializing your cherished pet. Losing a pet can be as painful as losing a family member - in fact our pets are family members, and it is normal to grieve for their loss as we would any other loved one. Knowing your beloved pet's days are numbered can be the start of the grieving process for many and this article can help you understand and prepare for the inevitable. Finding someone that understands pet grief and what you are going through can be difficult. Here are some avenues to consider when looking for a good set of ears. For a child, the loss of a pet is especially difficult. If your family has recently lost a pet, or if you are anticipating the loss of a pet that is old or sick, it’s a good idea to get ready for a realistic discussion with your child. Adjusting to life without your beloved pet can be hard. We sometimes find ourselves continuing with some of the routines we established with our pet only to realize they are really gone. Whether choosing pet cremation or pet burial you will find an array of companies to help you plan the final disposition of your pet's body and memorialize them for years to come. It’s never easy to say goodbye to a beloved pet, but a well-chosen pet memorial such as a pet urn, grave marker or cremation jewelry can help soothe some of the pain and keep your pet’s memory alive. 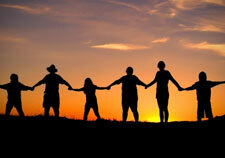 Find a grief counselor in your area for private one on one therapy. If you like to discuss your feeling amongst others try to locate a pet loss support group in your area. 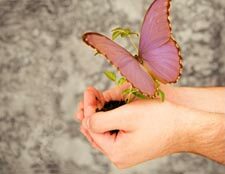 For those who prefer privacy you can use this directory to locate an online support forum to help you through your grief. Find a cremation provider that specializes in pet cremations within your area. Choosing pet burial in a pet cemetery? This directory will help you locate the closest pet cemteries in your area. With a growing number of pet owners electing to have a memorial service for their pets, this directory lists the few, but growing number of facilities catering to pet funerals. A Pet Memorial Service can help all family members to cope with the loss of a beloved family member. Finding a pet urn or cremation memorial for your pet's cremated ashes is a lot easier when you know what is available and where to buy it. Looking for the perfect pet grave marker and don't know where to start? This article discusses the different types of pet headstones and grave markers available in the marketplace. Click here if you are looking for a pet memorial for your departed pet.